What is a Self Study Course? Can I earn CEUs/Hours for a Self Study Course? How do I register for a Self Study Course? What do I need to view a Recorded Webinar Course? How do I start a Recorded Webinar Course? How do I download copies of the handouts? During a Recorded Webinar Course how do I Pause/Rewind? Troubleshooting / What should I do if I cannot access a Recorded Webinar Course? How do I earn CEUs/Hours for taking a Self Study Course? Self study courses included recorded, audio and text/transcript courses. Recorded courses are slide show presentations with voice over that are streamed from our web site and viewed on your computer. Often, these presentations include multimedia, as well. You can play, pause, rewind and review these courses as needed. Most recorded courses are recorded versions of Live Webinars held on the web site, others are presentations produced specifically for this format. As the courses are self paced, you can watch a recording during one session or over several sessions. Audio courses are the audio track of a recorded live webinar with no visual elements; audio courses are similar to podcasts and can be downloaded to your local device. Text/transcript courses include transcripts of live webinars and original articles. All self study courses are self paced. YES! The vast majority of self study courses are offered for CEUs/Hours, but you must verify which courses are offered for credit and by which association (ASHA/CASLPA). Please note that once a self study course is selected, you have 30 days past the selection date to take the CE exam and earn CEUs/Hours. Visit the AudiologyOnline home page; login to your AudiologyOnline account and click on the "Search Courses" link. 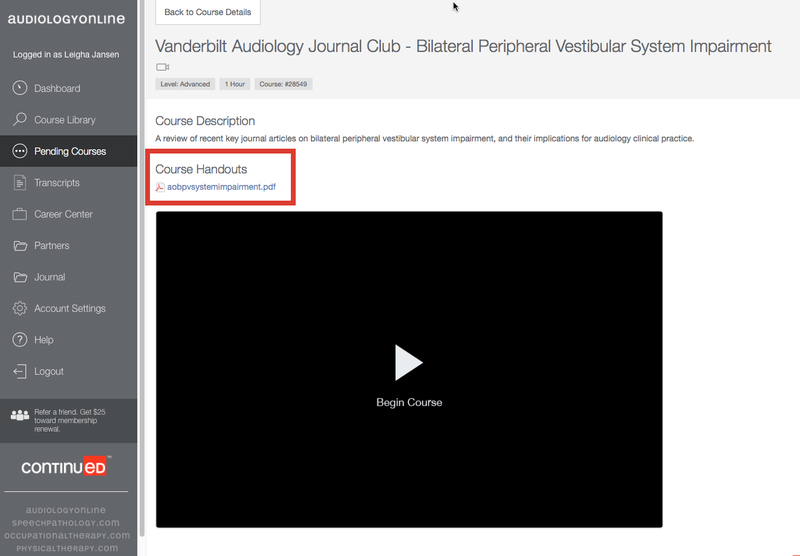 Search the course library by format by selecting the course format icon (recorded, audio, text/transcript). To select a course, click on the 'Register Now' button and select the 'Start Course' button. Please make sure you have all needed software/hardware installed on your computer as listed above. Go to the AudiologyOnline main page. Sign In to your AudiologyOnline account. Select the "Search Courses" link. If handouts are available, they can be downloaded from several locations prior to viewing the course. The handouts are available on the course details page, as well as just above the playback/content window. Simply click on the file name to download the handouts. It is at the discretion of the Presenter if there will be any handouts for a given course, therefore, not all recorded courses will have handouts that can be downloaded and printed out. Download files are typically in PDF format. Click here to download and install Adobe Reader (free). 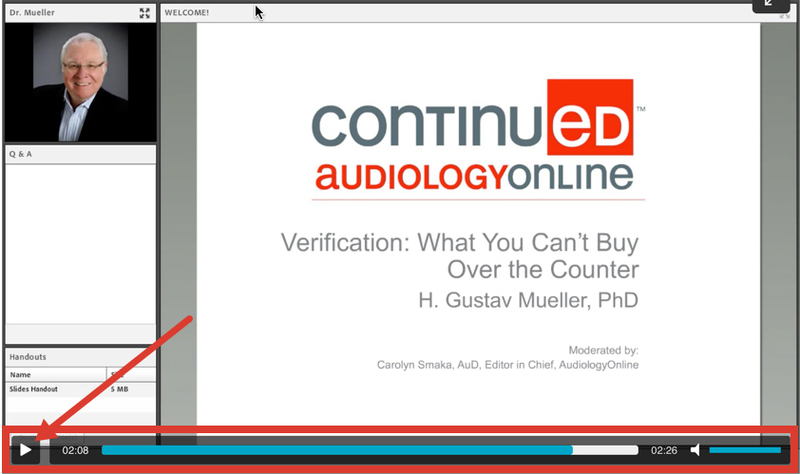 There is a player bar in the lower left corner of the screen to pause/play the recorded webinar course. To move forward or backward within the recording, simply click and drag the time indicator within the player bar. A sample screen shot is shown below highlighting the location of the player bar and the play/pause control. Step 2: Recorded webinar courses are streaming video that rely upon internet connectivity. To maximize your bandwidth, please close all other windows/programs and utilize a hard wired connection. If your issues persist, it is recommended you try another web browser. How do I earn CEUs/Hours for participating in a Self Study Course? You will be required to obtain a passing score of 80% on a brief multiple-choice examination. You will be given immediate feedback regarding the results of your exam and the opportunity to repeat the exam one additional time, if necessary. It is important to note that once you have selected a self study course you have 30 days to take the CE exam to earn CEUs/Hours. Additional CE processing information can be found on our CE Processing Help page.